Yesware’s Enterprise editions sync directly with Salesforce, making it easy to keep your Salesforce account in sync with your most up-to-date customer information. After a simple one-time setup, Yesware will automatically add your tracking events into Salesforce for the contact or lead that you’re communicating with! As your prospects interact with your message – opening it, clicking links inside it, and sending you replies – Salesforce will be updated in real-time with the same information. To get started, you’ll need to do a one-time authentication. 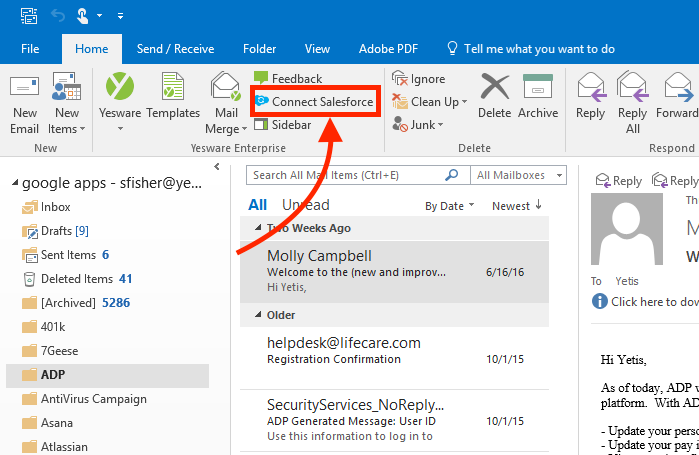 Begin by clicking on the Connect Salesforce button (top left corner of Outlook). You’ll be prompted to log into your Salesforce account (if you aren’t logged in already) and grant access to Yesware by clicking the blue Accept button. Return to Outlook and the Connect with Salesforce button should now be replaced with the Log To Salesforce Button. If this doesn’t happen automatically, you may need to restart your Outlook. Each one of these tasks will also give you full details about the activity - where they were open, on which device, and when all of this activity occurred. You can toggle this off and on as needed using the “Log to Salesforce” box in the Yesware toolbar in the Outlook compose window. No more switching back and forth between Salesforce and Outlook – Yesware brings the two together! The Salesforce sidebar displays your history with your contact while you’re viewing an email. Each one of the tasks in your activity history is clickable and will bring you right to the Salesforce page with full details of said activity. Not only can you see your history with your contact, but you can also create new tasks directly from our sidebar. Whether you use tasks to add a quick note about your most recent email from your prospect or remind yourself to follow up with them, Yesware helps you stay organized and efficient. You can activate the sidebar in your Outlook by selecting the Sidebar button at the top of Outlook. Tired of manually updating your Salesforce calendar every time you schedule a meeting? Now, Yesware syncs your newly-created Outlook events (and event updates) to Salesforce within a matter of minutes – no more calendar confusion! 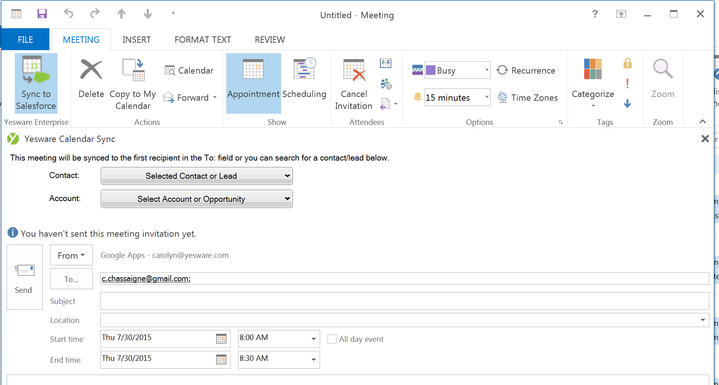 While creating a new calendar meeting in Outlook, click the "Sync to Salesforce" icon in your Outlook ribbon.